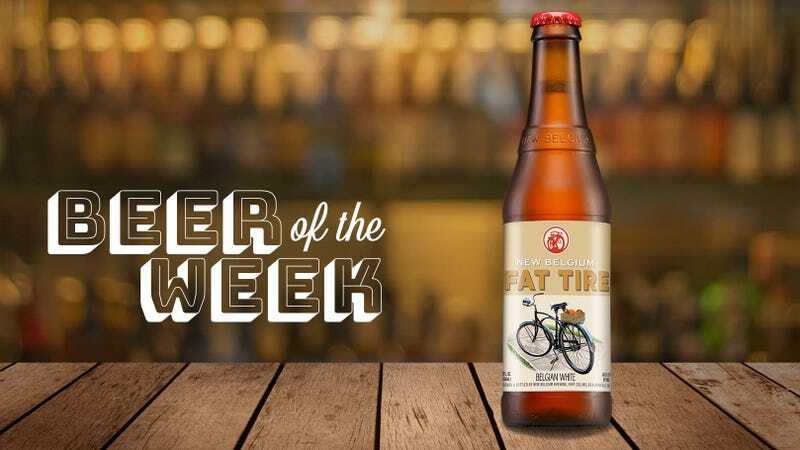 New Belgium’s Fat Tire is an unimpeachable craft beer icon, up there with Sierra Nevada Pale Ale and Sam Adams Boston Lager in terms of enduring classics worth revisiting. Fort Collins, Colorado-based New Belgium first brewed the original Fat Tire amber ale 25 years ago, and it’s taken the brewery a quarter century to add another beer to the Fat Tire lineup. Released in August 2017, Fat Tire Belgian White is brewed in the witbier style, with Belgian ale yeast, a bit of coriander, grains of paradise, and Seville orange peel. It demonstrates New Belgium getting back to its Belgian brewing roots; recent years have seen the brewery dream up beers in all sorts of directions, from Voodoo Ranger Juicy Haze IPA to Tartastic Raspberry Lime Ale. Those are fine beers, too, but some of us 30-somethings miss the old New Belgium a bit. With Belgian White, she’s back baby. The beer looks gorgeous—oats and wheat in the grain bill give it a huge, picture-perfect head atop a lightly foggy, lemon-custard-colored pour. All the signature witbier aromas are there, but amplified thanks to the additional fruit in the recipe: tons of lime, noticeable grains of paradise, white peppercorn, a touch of vanilla, cracked coriander, with lemony wheat’s sturdy base props it all up. There’s nothing subtle about this, rather all the necessary components are there, loud and clear. The flavors are superfresh and equally bold, with coriander coming more to the fore on the palate than it did in the nose. Orange is restrained and mellow; the wheat is equal parts citrusy and bready. After a few sips, the coriander continues to build—the brewery boasts that the coriander’s ground at the Old Town Spice Shop blocks from the brewhouse—and stops just short of astringent. That’s my only gripe with the beer, which is otherwise refreshing, distinctly Belgian, and not beating me over the head with orange. The wheat does most of the talking, as it should. I want to champion this beer not just because it’s tasty, but because it’s a worthy of bearing the Fat Tire family crest. Call me old-fashioned, but this is what I want and expect from New Belgium. Their greatest hits have come from innovations within the umbrella Belgian tradition; their Lips of Faith series is a great example of this. Because the actual witbiers brewed in Belgium and exported to American shelves are often a freshness crapshoot, I’d steer newbies toward this version. Good work, New Belgium—more of this, please. New Belgium Fat Tire Belgian White is available nationally year-round; check its availability near you. Have a beer you think should we should consider for inclusion in an upcoming Beer of the Week column? Email details to beer@thetakeout.com. What&apos;s the difference between all those international yogurts?